Robyn Gordon is a visual artist who works with a wide variety of materials and techniques to interpret and depict forms and relationships in the natural environment, particularly coastal and marine habitat. She is interested in the concept that science and technology allow us to change our natural environment to suit our perceived needs, but that we must get the balance right. Robyn wants to show that attempts to dominate nature are futile and that our very survival requires co-operative, symbiotic strategies. Since 1980, Robyn's work has been regularly exhibited, in both solo and selected group shows, throughout Australia. e.g. National Gallery of Australia, Canberra; State galleries of NSW, WA, SA, TAS, NT, Powerhouse Museum, Sydney. Her work has also been exhibited in Great Britain (e.g. Victoria and Albert Museum, London), France, Spain, Germany, USA, New Zealand, Japan, Korea and PR of China. Examples of Robyn's work are represented in the National Gallery of Australia as well as state, territory and regional galleries and many institutional, corporate and private collections. 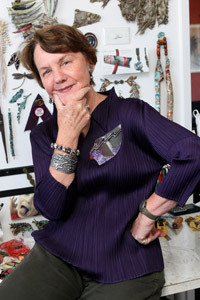 Robyn has received several awards for her work. She has undertaken numerous commissions including sculptural installations, specific occasion jewellery collections for organizations or for individuals, silkscreen print editions, and also, costume and set design for contemporary dance. Her wearable body adornment enjoys a very wide audience - Robyn utilises these pieces of work as a communication between maker, wearer and observer. Robyn has had a long career in art teaching, both at secondary and tertiary levels. She also served as a Member of the Australian Government's Task Force on Education and the Arts, as well as a Member of the Australian Governments National Reference Group on Australian Studies in the Curriculum. Her work has been documented in a long list of publications as well as on radio, film and TV. I grew up on the eastern coast of Australia, exploring beach, littoral zone, coral reef and bushland. I have bowerbird qualities, constantly collecting objects, especially weathered fragments revealing their history, and regularly photographing or sketching the visual environment. I'm interested in both close focus and bird's eye views. I trained as a teacher and spent many years stimulating a spirit of enquiry and perception in my students, which of course deepened my own perception simultaneously. I've also experienced wide reaching travels in Europe, parts of the Middle East, Asia and the Pacific region - I find I've recorded many suspended images, cultural tokens, historical sites, environmental adornments which have influenced my work. Initially my main interest was in textiles, but I moved towards body adornment - tribal, transient tokens of wealth and place, the basic desire felt by all people regardless of age, race or status to adorn their bodies for many purposes - spiritualism, ritual, tokenism, identification, pride and joy in decoration, individualism - a visual language worn like a badge. My jewellery works often have elements of fantasy and the unexpected - bold additions to the body, an outward expression of the personality of the wearer. I like my works to sit well on the body, to be comfortable, to elicit responses from the viewer/observer - the walls of the body become a walking gallery. Conceptually I explore intimate memories of place and tokens of landscape. I'm interested in the interconnectedness of forms and systems, and the irregularity and unpredictability of our environment. Coral reefs and marine life are particularly interesting to me as they encapsulate within their forms the history of the dynamic natural forces where they evolved. I am not really concerned with fashion. Whether creating jewellery or other images and objects, I expect my work to be appreciated and judged by the same criteria as any other art form. My aesthetic concerns are graphic imagery, painterly qualities, building with colour in the fauve sense, poetic colour which is very often an intrinsic part of the structure of the piece; plus texture, both visual and tactile, is important. I utilize a wide range of media and enjoy the challenge of making an odd assortment of materials form a cohesive work. As a maker, I'm always searching to push beyond, to discover new realms, experiment with media and techniques, experience both limitations and amazing innovations - making is an ongoing process for me, in a continual state of flux. It can be both challenging and rewarding to aim to make a small fragment which has the power within it to suggest the greater whole. Whatever forms and media I may be using at a given moment as the vehicle for my expression, there is a thread which links my aesthetic and philosophical concerns. © Copyright Robyn Gordon 2006–2019. Image usage is negotiable - Contact Robyn Gordon or VISCOPY.